As I mentioned, way down there below the crazy bone pictures and the Trump observations, in part one of this series, my newest book is, for all intents and purposes, done. 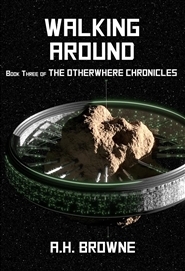 That would be book four of my action/humor science fiction series, The Otherwhere Chronicles… Otherwheres Collide. The little book that is in this picture is that book. A slightly larger version of that cover photo is in my sidebar now, and as soon as I sort out some technical glitches, it will be available for sale. Right now, the link doesn’t work. And yes, I am still editing that novel where I am trying to turn the Disney fairy tale princess genre on its heads. But, I write all my books in different ways. I need a hook… a gimmick… a… something… to get me motivated for starting the process. 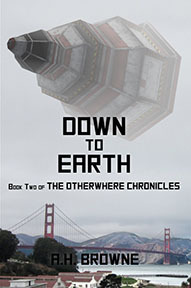 In the science fiction series, I wrote the whole thing- all four books- without ever knowing what was happening next. I made it all up as I went. Hundreds of alien and human characters, and billions of improbable situations, all just pulled out of my crack squirrel-infested cranium as I went. The murder mystery set in World War Two London, I invented the characters for the most part, but let the story unfold on its own. For the princess novel, I story-boarded the whole thing out, allowing some room for things to go their own way. This next novel, which will be a thriller/suspense/young woman’s descent into madness and murder, has its own hook. I am starting at the end, and every other chapter will be a flashback into her life, slowly exposing how she ends up where she is. The chapters taking place in the present will move the story slowly to its conclusion, even as you learn what led to what is happening in them. So tomorrow, I am going to start all the chapters, title them, type a few sentences, and then save them. I will go back to any chapter when it calls me to do so, and add more. I am not writing from beginning to end. I am writing it all at once, so to speak. I am very excited. Also, it is all going to take place in the San Francisco Bay Area, where I grew up, so it will have a real sense of realism. I have a working title. The young lady is named Jinny. The book will be called: Jinny Was. I might even start each and every chapter with the words ‘Jinny was’… oh yeah. This entry was posted in fiction and tagged art, authors, books, humor, murder, novels, science fiction, writing, writing a novel. Bookmark the permalink.